This TA Technix sport suspension kit is for the Mazda MX6 type GE6 from 1992-1997. This TA Technix sport suspension kit is for the Mazda 626 type GE from 1991-1997. 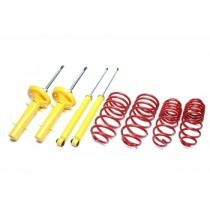 This TA Technxi sport suspension kit is for the Mazda 626 type GF from 1997-2002 without station wagon. This TA Technix sport suspension kit is for the Mazda 323F type BA from 1994-1998. This TA Technix sport suspension kit is for the Mazda 323S/F type BJ from 1998-2003. This TA Technix sport suspension kit is for the Mazda 3 type BK from 2003-2009. This TA Technix sport usspension kit is for the Mazda MX5 type NA from 1990-1998.